It was late afternoon on a November day. The mellow sun sat on the western horizon just above the brown and grey tree-less hills when we fetched up outside Lahore. The place was deserted. The doors set in high mud walls were closed and padlocked, not a soul walked the narrow lanes. The squares of agricultural plots were desiccated with a thick layer of powdery dust upon which stood sere stalks of what would have been corn and what were once handsome, spreading mulberry trees were mere leaf-less skeletons. It was a ghost town we had entered. My friend Dawood decided we should drive on to Dilly. And so, five minutes later we turned off the highway and entered Dilly. Ten minutes between Lahore and Dilly and not even an international border to cross may sound a geographical anomaly. But in Loralai district of Balochistan this is reality. And its origin lies two centuries, perhaps farther, in the past. Dilly was scarcely better. Here too dried out fields lay fallow behind mud walls along which ran desiccated channels where water once flowed; here too were skeletal remains of once handsome trees under whose cooling shade the Dilly-wallahs would have reposed during the long summer afternoons and here were also a few emaciated goats and donkeys browsing in the dust. We passed by padlocked doors opening into deserted streets seeking the home of Malik Abdus Samad. 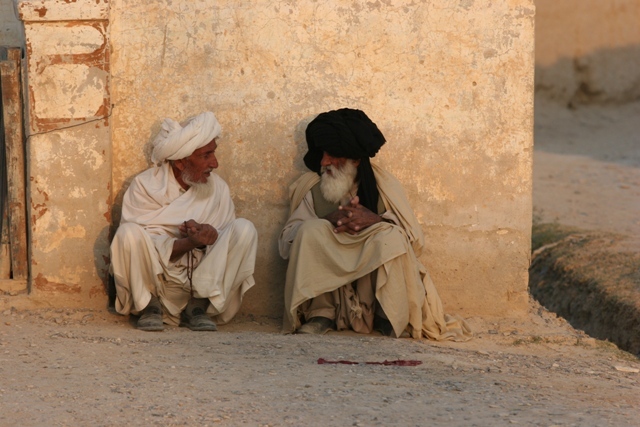 He was an elder and one of the better off land-owners of the village and with him we had hoped to talk of the old days. Once we could have stopped anywhere we wished to ask directions; now we were hard put to meet with anyone. After a couple of wrong turns and a few knocks on doors that were not padlocked, we fetched up outside the Malik’s home. His sons led us across the high-walled courtyard and into a dimly lit room. Malik Abdus Samad, perhaps in his late fifties, with a full-bearded chubby face lay in a bed under a thick quilt. He was crippled after an accident some months earlier. But he was willing to talk. 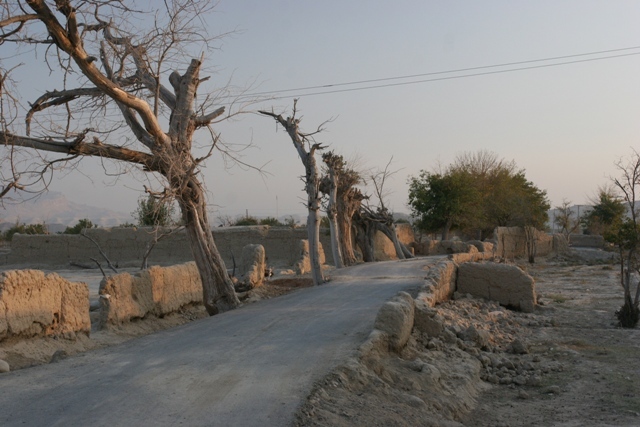 This part of Loralai had long been renowned for its almonds – and not just one, but three different species. There was also a goodly quantity of mulberry, apricot, pomegranate and some peach to be had. The well-off Loralai land-holder could safely boast of five or six thousand almond trees and a hefty fiscal turnover annually from its crop. So plentiful was the yield of the almond orchards that every autumn traders loaded up their camels and ox-carts with their produce and began the long slog to the markets of Lahore and Delhi. But that is hearsay; what persists in memory is the ox-cart journey to Harnai where they loaded their produce on the train to the plains. And this would have been only after the late 1880s when the railway line was laid. With the proceeds of their almond sales, farmers enlarged their plantations and the new townships that came up near older homesteads were given the names of the ones the farmers traded with: those who took their produce to Lahore called theirs by that name and the group trading with Delhi called their township Dilly (with a palatal d). The Malik remembered a time before partition when he accompanied his father on the bullock cart laden with their almond crop on the three-day journey to Harnai. There they loaded their precious cargo on the train and rode another two days to Lahore. Sometimes there journey extended all the way to Delhi. But then came the partition of the subcontinent and Lahore was the last limit of their forays. Proceeds were fair and it was a good life that Malik Abdus Samad can look back on. Things went well until the 1980s when the worst drought in human memory hit Loralai together with most other parts of the country. The district being rain-fed, produce began to peter off until there came a spring when the trees just barely broke out in blossom. The farmers did not lose faith hoping that the summer would bring some rain or the next winter snow on the mountains. The aquifer would be recharged, they hoped, and it would soon be back to business as usual. But that did not happen and the following couple of years saw the orchards start to die off. Today in Dilly and Lahore it is not a rare land-owner who will tell you that he lost about eighty percent of his almond trees – Samad being no exception. And the almond tree is the most drought-resistant and least irrigation intensive; other fruit trees being less hardy were completely wiped out. This is the typical scale of loss. The rich were reduced to poverty and the not so well-off simply moved out of the area to seek their fortunes elsewhere. With farming being the only craft they knew, many joined the coal mines of Harnai and Shareg; others went farther afield to the cities of Sindh and Punjab to work as unskilled labourers. And so it was that Lahore came to be completely deserted and Dilly partly so. Time is that these villages are now peopled only by the elderly, women and children. Young men able of body and mind can only be seen during religious holidays. Lahore and Dilly in remote Loralai are now hopeful again. Since the winter of 2005, things have started to look up. Early that year, the first snow of many years fell on the neighbouring hills and the villages themselves saw some rain. The farmers are now replanting their orchards and some of the younger members are only too glad to be returning home to tend to this growing responsibility. And so life edges slowly back to normal in Lahore and Dilly.